I feel really annoyed when people end up buying or ordering food trying to be healthy about their options, when in turn, a lot of “healthy” options at restaurants/grocery stores are quite the contrary. So many salad items at restaurants are still high in calorie and fat content. Sure, there are the vegetables, but there’s also the creamy dressing and other additions that really fatten up the salad. You are much better off ordering an appetizer or a light chicken/fish entree and practicing portion control that way. Then, there’s the “healthy” food you find in grocery stores. Healthy chips, healthy packaged foods, etc. Hmm, upon close examination of the nutritional facts though, most of these foods aren’t necessarily THAT much better for you. Is it really low in calorie and fat? Is it high in fiber or protein? What about the serving size–how much is a serving? 1 bag? Or is it half of it? It is no wonder we as a society struggle with portions and trying to be healthy–after all, most of us would pick up a “small” bag of pretzels and eat it, assuming we are consuming one serving. But then you look at the facts and realize that the bag actually holds TWO servings–so you’re eating twice the amount of calories listed on the nutrition facts. Not a fun surprise huh? This brings me to another related rant: I feel like a lot of people think that organic = healthy. Not necessarily. Organic simply means that the food was processed in as natural of a state as possible. No chemicals used, nothing unnatural–just pure natural goodness. But there’s still the calories. I walked into Trader Joe’s a few days ago to buy groceries and was annoyed at looking at all the nutritional facts of the foods/products there. Oh, buy some pumpkin bread..but wait, 1/16th of a slice has how many calories?! 360 calories (or somewhere around there…)…that’s a lot of calories there. You could eat an equivalent of several fruits, vegetables, whole grains for that amount of calories. Ugh…and I am sure some people venture into the store, thinking “Oh, I’m buying organic, therefore I am being healthy!” Yes, maybe you are being healthier by not consuming chemically-processed foods, but you’re still eating a ton of calories if you’re not watching your portions. So in conclusion, be aware of what you eat–try to go for real fruits and vegetables when possible, not all these other products that claim they are healthy alternatives to the real thing. Watch your portion sizes; you don’t have to eat that whole plate of food at the restaurant if you don’t want to. What is your initial reaction when someone says to you, “I sell hot dogs” ? Would you laugh? Would you feel a bit of disbelief at this job? Would you pity the person? You get to work outside (which has its pros and cons, depending on the weather), get to meet all kinds of people, and best of all, great tips (yes, money…). It all depends on where you are selling the hot dogs though–if you’re in an area where people have low income, then maybe the job won’t be as fun. But selling hot dogs to people with a lot of dispensable income (i.e., SF, NYC)….well, the job really isn’t so bad. I wouldn’t make a profession out of it, but it’s a great (and unique) job than working at a restaurant. Plus, since most people don’t have high expectations for the service at a hot dog stand…well, that’s a great spot for a smart businessperson to aim his or her differentiation strategy at. Great service at a hot dog stand–it’s completely doable. It makes that $4.25 hot dog completely worth it when you have a generous vendor handing you the hot dog in a very sanitary way (using tongs, not hands!). Posted on March 1, 2008 Categories #foodie, fast food, Hot Dog Days2 Comments on Selling Hot Dogs. Okay, so I have known about Edible Arrangements for a few months now, only because there’s a store right in my neighborhood. I have walked by it several times and always wondering “What could they mean by ‘edible’ arrangements? Edible flowers?” I really was thinking that, since their logo looks like an arrangement of flowers. Well, only today did I learn that the Edible Arrangements are actually fruit/chocolate arranged to look like flower bouquets. What a concept! Kind of feel like it’s more “bang for the buck” than a regular bouquet of flowers. Flowers, unfortunately, wilt and die and really, all you can do with them is look at them and admire, and water them. I’m not knocking flowers, and I actually love flowers (when I receive them), but they’re one of those things in life that is “nice to have” but not necessary (at least, to me). 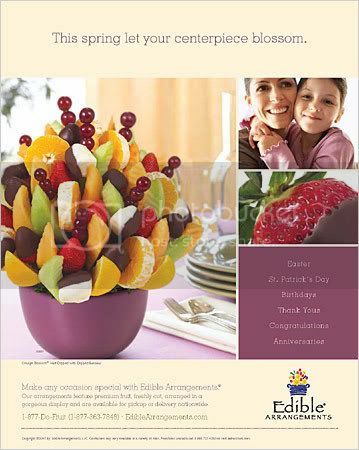 With the Edible Arrangements, you can still sit and admire, but you will enjoy diving in and eating the tasty fruit and chocolates as well. The fruit is all natural (a big plus–I don’t like how a lot of these “fruit” products these days contain preservatives, sugar, and other unnecessary things) and is guaranteed fresh at delivery. Prices range from $40 to $200, I’m guessing depending on the size of the arrangement and how special of an occasion you are buying for. After reading the article in NYTimes about Edible Arrangements, I want to go out and buy an arrangement, merely so I marvel at it and eat it. I love fruit anyway, so it’s not a bad deal at all. Hmm, I but I think I will have to find a good reason/occasion to splurge on the arrangement….